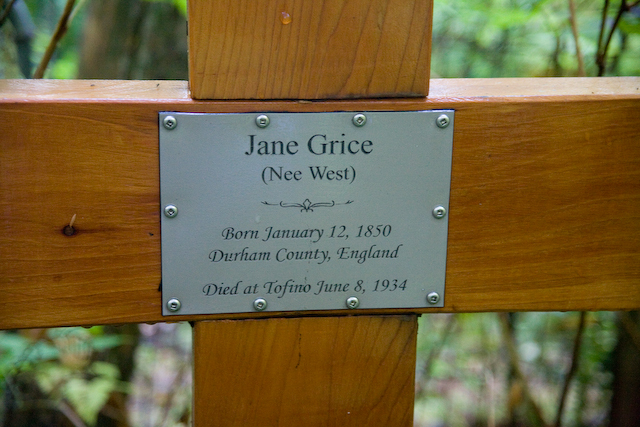 Jane was born 6 days after John and died 3 days after him! Which would make her 3 days younger than John when she died! They also were born in the same town & I assume died in the same place as well? They died during the “Great Depression” as well. The medical report listed their deaths as being “cardiac failure”. John died of “Enteritis” & Jane of “Bronchitis”. I’ve noticed that people who are together for a long time,usually die soon after their mate. There’s something to be said about that! This fellow died at the early age of 26! He died in 1942. I didn’t see any Military markings,so I don’t think he died because of the war? I’m not sure what is going on here? On the far left is what I believe to be the Mother? Kamejiro. (I’m not sure of the spelling?) She lived to be 51 years old. It looks like she had a son when she was 43. 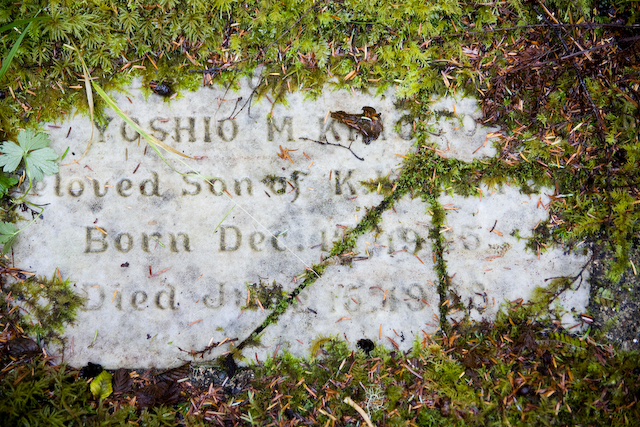 Yoshio M. He appears to of died 3 years later! She would of been 45 than and it must of been hard on her! On the right is someone named Kijiro. I do not know if this is a male or female? I’m not familiar with Japanese names? Sorry. If this is the father,he was a younger father. 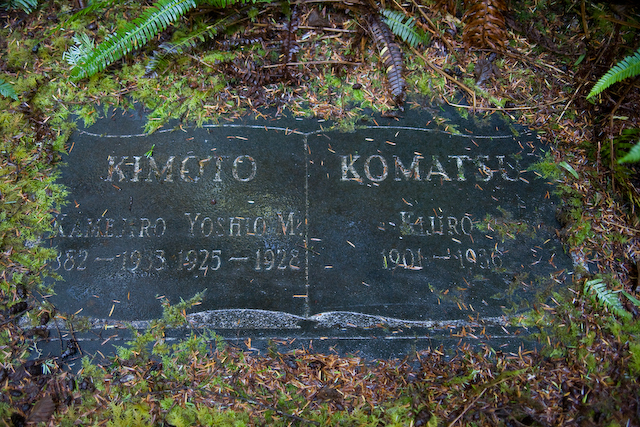 She would of been 43 and he 24 when they had little Yoshio in 1925. Notice the porcelain flowers under the glass dome. 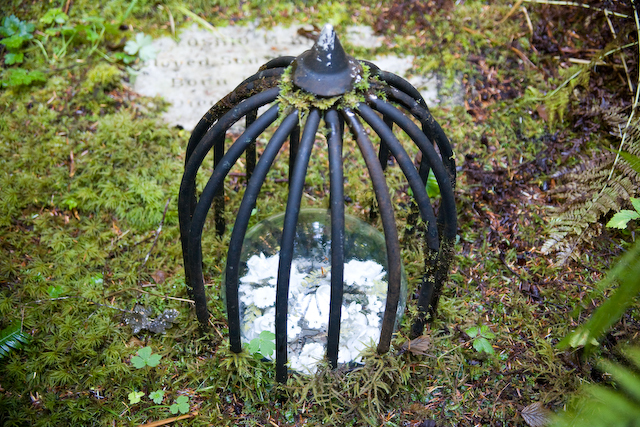 The dome is protected by a iron cage. It stops falling tree debris during wind storms. I have no knowledge about the person with the surname of “Komatsu”. 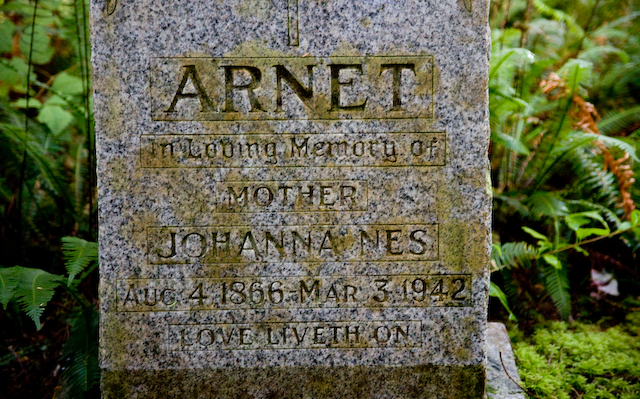 This person was born in 1881 and died in 1938.I say person because I do not know if this was a male or female? I find it odd that their was no month for birth or death? 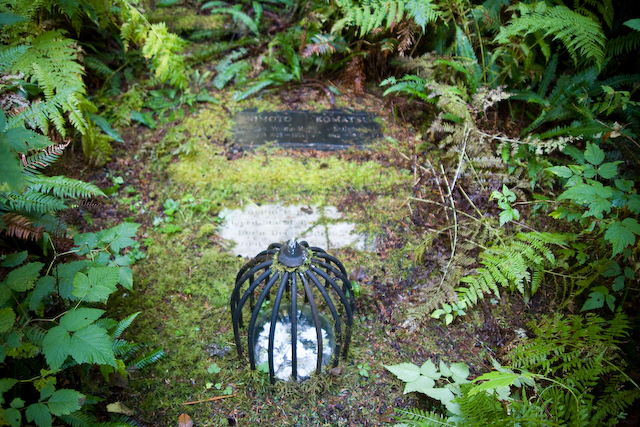 I assume that the people who buried this person did not know him or her very well? 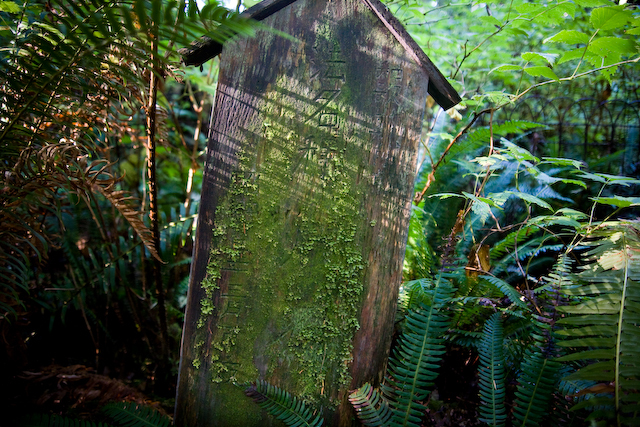 Someone who knows Japanese may be able to read the wooden tombstone? 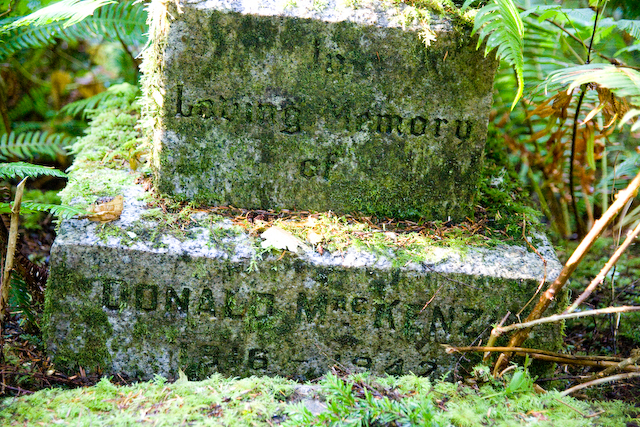 The Japanese settled here in Tofino but were rounded up after Pearl Harbour and held in detention camps. 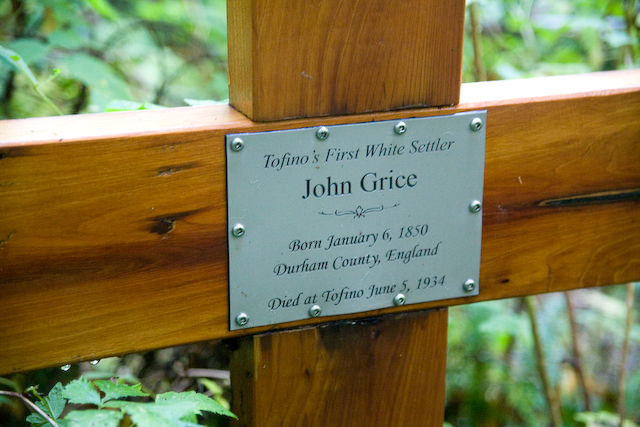 After the war,the Japanese did not or could not settle back into Tofino. Update:July 23rd,2015 – Just found out from a relative (Chris Sakauye) that this person was a male. 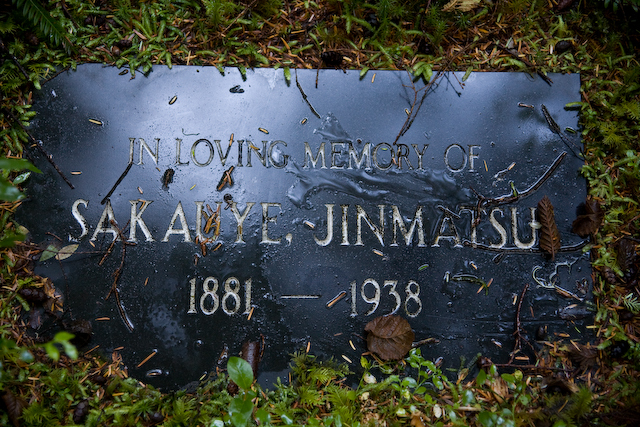 Sakauye Jinmatsu was his Great Grandfather. 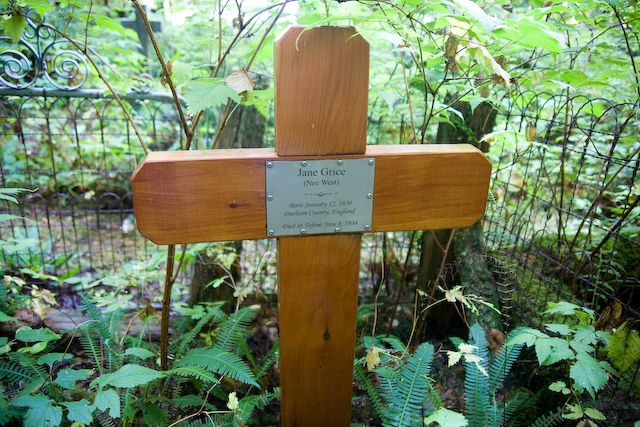 Update: July 29th,2015 -I’m Chris’s uncle and I’ll leave a little more background on Jinmatsu. 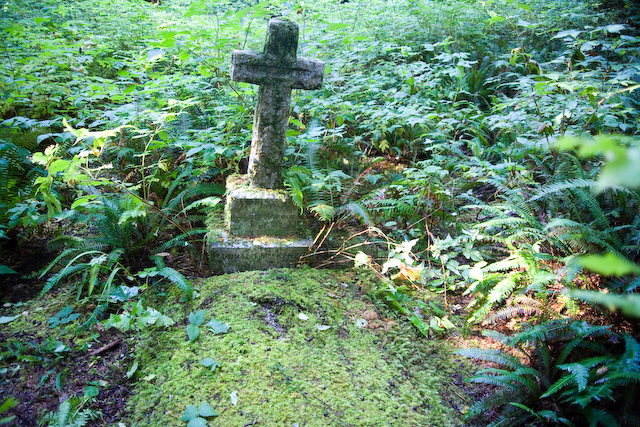 He was buried on Morpheus island and his grave marker was joined by the more modern one in the late 90’s by his surviving children at the time. 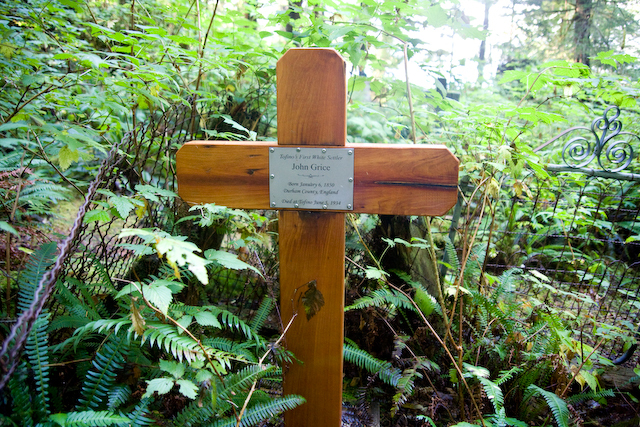 The Sakauye family, during the early part of the century (up to 1942) lived on the Eik property and the Eik cedar was well remembered by all. Because it was raining/sleeting today,the light was extremely bad! On days like this I always upload a shot from the old cemetery for filler. 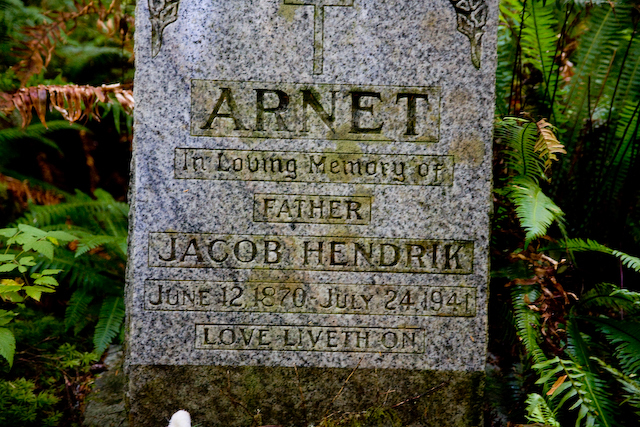 Jacob died at the age of 71 on July 24th,1941 & his wife, Johanna joined him 7 months later. 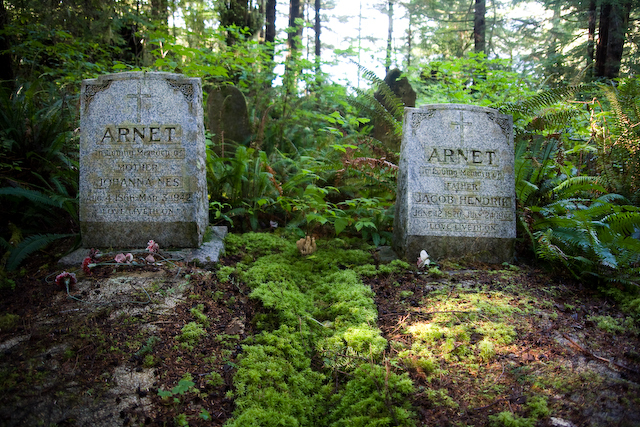 These two have the best tombstones in the cemetery! I know one of their Grand Children. Roland Arnet. (Roly) He has a Oyster farm up in Lemmins Inlet.